1st June, 1916. Sir,—I have the honour to submit a report on the operations of the Force under my command from the date on which I assumed command to the 31st May, 1916. 1. On 9th January, 1916, I arrived in Cairo, and, on the following day, took over the command of the Mediterranean Expeditionary Force from General Sir C. C. Monro, G.C.M.G., K.C.B., who had himself arrived from Mudros but a few days before. At that date the Mediterranean Expeditionary Force was in a state of transition as regards its larger component, the Dardanelles Army. On the night of the 8th/9th January this Army had completed its successful evacuation of Cape Helles; its units were still concentrated at Mudros and Imbros awaiting transport to Egypt, where all the Force, excluding the Salonica Army, had been ordered to concentrate. Meanwhile, a portion of the Force, which had been set free by the earlier evacuation of the Suvla Bay and Anzac positions, had already arrived in Egypt, where it had come under the command of General Sir John Maxwell, K.C.B., K.C.M.G. The concentration of the Australian and New Zealand Army Corps, for instance, was practically complete, and the 53rd Division was occupied in operations on the Western Frontier of Egypt. General Headquarters of the Mediterranean Expeditionary Force were temporarily established in Cairo. The instructions which I had received from the Secretary of State for War placed under my command all organized formations then in. Egypt, or on their way to Egypt, with the exception of such troops as might be considered necessary for the defence of Egypt and the Nile Valley against attack from the west, or for maintaining order in the Nile Valley and the Nile Delta. The function .assigned to me was that of protecting Egypt against attack from the east, and the westward limit of my command was roughly fixed by a line running north and south approximately five miles west of the Suez Canal. The British Force at Salonica was also placed under my general supervision. 2. During the period under review, in addition to the extensive .military preparations required for the defence of the eastern front, the amount of purely administrative work thrown, on all sections of my Staff has been extremely heavy. The exigencies of the Gallipoli campaign had placed the Force under my command in a state of serious disorganisation. Some units were in Egypt, others on the sea, others in Aegean ports. It was not until the end of February that the last units of the Dardanelles Army reached Egypt. Every day for over six weeks ship loads of troops, guns, animals and transport were arriving at Alexandria and Port Said. The components of this mass had to be disentangled and forwarded to their proper destinations; old units had to be reorganised, new units to be created, brigades, divisions, Army Corps to be reformed. The British troops from Gallipoli were incomplete in personnel and material. It was urgently necessary to bring them up to strength, reequip them, and provide them with train and mechanical transport on a modified scale. The Australasian troops also needed re-equipment, and, in their case, there was the additional problem of dealing with a mass of unabsorbed reinforcements. Further training of officers and men was an urgent necessity. Moreover, the embarkation of troops for service elsewhere began in February and continued without intermission till the end of April. To this work must be added not only the maintenance of my Force, both in Egypt and Salonica, with animals, supplies, ordnance stores, works material, and medical and veterinary stores, but also the provision and despatch of ordnance stores, works material, and supplies specially demanded for Basrah and East Africa. The bulk of the work of disembarkation and embarkation, including the very heavy work of railway transport, fell upon the staffs of my Deputy Quartermaster-General and Inspector General of Communications, to whom great credit is due. This work, together with the task of supplying and maintaining the troops operating on the eastern, and subsequently also on the western, front, was efficiently carried out by the Ordnance, Supply and Transport, Remount, and Works departments. As regards instruction, a training centre for Australasian reinforcements was started at Tel el Kebir and continued until it was decided that the Australasian training depots should be transferred to England. Further, a machine gun school was formed at Ismailia which, after producing excellent results, was merged in the Imperial School of Instruction at Zeitoun. The latter institution, which came under my control after 19th March, has since been increased in size so as to train officers in all branches of warfare. Under its commandant, Lieut.-Colonel the Hon. E. M. Colston, M.V.O., its work has been most valuable. Besides the ordinary courses, for officers and non-commissioned officers, it holds machine gun, Lewis gun, signal and telephone, artillery, Stokes gun, and grenadier classes. Between 7th January and 31st May, 1,166 officers and 5,512 other ranks attended and passed in the various classes. A machine gun school was also started at Salonica. Excellent work has been done by the signal service during this period. In the first place, it has efficiently carried out the work of refitting the signal units from the Peninsula, reorganising them to suit the conditions peculiar to Egypt, and training locally officers and men to fill the gaps and meet the increased demand for signallers and telegraphists. Ninety-four officers and 1,305 other ranks have been trained in these duties at Zeitoun and Alexandria this year. Secondly, it has had to provide intercommunication for troops engaged upon over 1,000 miles of front, which has involved the development of an unusually extensive network of military telegraphs. All the resource and ingenuity of the service has been taxed to cope with the conditions peculiar to this field of operations—abnormal distances, unusual means of transport, desert, sand storms and mirage. Lastly, it has substituted a military telegraph and telephone service for the civil system which, until this year, had been the only available means of communication throughout Egypt and was worked mainly by native personnel. I would also specially mention the survey work that has been carried out since the arrival of the Mediterranean Expeditionary Force in Egypt. In addition to the standardisation, printing and issue of tactical maps of Sinai to the whole of the army on the eastern front, a new survey on a large scale of the Canal zone and certain areas east of our lines and advanced posts has been continuously carried on by the Topographical Section of the Intelligence Branch, working in close co-operation with the Royal Flying Corps. This survey, which has now been in process for nearly six months, is now approaching Qatia. I believe that the map based on this survey is the first map entirely constructed on this principle. The work was initiated by Mr. E. M. Dowson, Director-General, Survey of Egypt, who placed his resources at the disposal of the Mediterranean Expeditionary Force. The actual direction of the work has been in the hands of the Intelligence Branch of my General Staff, and is based on experience, gained in Gallipoli, of the production of trench maps from aeroplane photographs, controlled by ordinary field survey methods. Co-operation in this survey has been part of the routine of the Royal Flying Corps. These labours, most of which demanded the utmost despatch in their completion, were carried out concurrently with the conduct of more strictly military operations, to my report on which I will now proceed. 3. When I arrived in Egypt the intentions of the enemy as regards an attack on the Suez Canal were by no means certain. Though his new means of communication in southern Syria and Sinai, commenced with this end in view, were still in a backward state, he undoubtedly had at his disposal the troops, amounting to 250,000 men or more, necessary for such an attack. The adequate defence of the Canal was, therefore, a matter of serious importance. The outline of a scheme of defence had already been prepared; certain works were being constructed, railways and pipelines and roads commenced, and troops were being concentrated in the three sections of the Canal defences, which were based on Suez, Ismailia and Port Said respectively. A satisfactory agreement was arrived at between Sir John Maxwell and myself regarding the delimitations of our respective spheres of command and the troops to be allotted to him. On 22nd January General Headquarters opened at Ismailia. My chief concern was now the defence of the Canal. The work on the stationary defences was backward. Difficulties of water supply on the east bank were increased by shortage of piping; labour troubles had delayed the progress of roads and railways. Guns had) still to be emplaced, and no part of the front defence line was actually occupied by troops. Nevertheless, as there were no signs of an imminent advance on the part of the enemy, the question of the stationary defences caused me no serious anxiety, though everything possible was done to hasten on their completion. The organisation of the offensive defence, which time has proved to be paramount, was, however, a pressing matter hitherto untouched. Practically nothing had been done towards the organisation of mobile forces. The collection of a large number of riding and transport camels had to be undertaken at once .and a plan of campaign to be devised. Moreover, time was short, for it was plain that any offensive on a large scale by the enemy must be commenced before the middle of March. For the force under my command the only possible line of advance was along the northern line from Qantara towards Qatia and El Arish, and the task was at once taken up of examining the possibilities of an offensive on this line and solving the problem of maintaining a considerable force at Qatia during the summer months. The result of these investigations is to be seen in my memorandum of 15th February addressed to the Chief of the Imperial General Staff, in which I stated that the first step towards securing the true base for the defence of Egypt was an advance to a suitable position east of Qatia and the construction of a railway to that place. Up to the middle of February aeroplane reconnaissance was the only active military operation possible, owing to the need for reorganising the units of the Force and for pushing on the work of laying roads, pipelines and railways to enable an adequate force to be maintained on, and beyond, the front lines. The magnitude of the latter task may be judged from the fact that, during the period covered by this despatch, 114 miles of road, 154 miles of pipelines, and 252 miles of railway were laid. The work of the Royal Flying Corps, most actively and gallantly pursued, enabled me to keep the enemy's posts at Hassana, Nekhl and El Arish under close observation, and neither their reports nor those of the equally gallant and efficient Naval Air Service, which observed by seaplane the garrisons of southern Syria, showed any concentration of enemy troops for a big attack on the Canal. On February 16th the Russian Army entered Erzerum, inflicting a heavy defeat on the Turkish Army opposed to it. It seemed likely then that all the enemy's schemes for attacking the Canal in force must, for the present, fall to the ground, and such has proved to be the case. The garrisons in Syria were gradually reduced, until it was estimated that not more than 60,000 men were available for an attack on Egypt. During the latter half of February the work of reconnaissance beyond the front line began in earnest, especially in the northern section, where the 15th Corps patrolled as far as Bir El Nuss and Hod Um Ugba, establishing the fact that the country was all clear and practically deserted. At this period, too, a reconnaissance was undertaken from Tor. This post, and that of Abu Zeneima, both on the Sinaitic coast south of Suez, were then garrisoned by a battalion of the Egyptian Army— subsequently by the 14th Sikhs—and had, by arrangement with General Maxwell, come under my direction. The reconnaissance from Tor was undertaken against a concentration of a small body of the enemy at Wadi Ginneh, some miles distant from the coast. This minor operation was in every way successful, though the enemy had fled before their camp was reached, leaving behind their baggage, which was destroyed. The troops then returned without further incident. 4. From March onwards, the rapid embarkation of troops for France depleted my forces considerably. During this month the military operations on the eastern front, if not momentous, were satisfactory. On 6th March a very gallant and successful attack on Hassana was made by the Royal Flying Corps, which resulted in the destruction of the pumping station. Bomb attacks were made on Nekhl and other places in Sinai, and on 24th March Hassana was again attacked in force with bombs. In the northern sector, the preliminary steps were being taken for the advance to Qatia. Week by week permanent posts were pushed further ahead, special reconnaissances were made with a view to testing the water supply, and the broad gauge railway from Qantara to Qatia was being carried forward as fast as possible. 5. On 11th March I received instructions from the late Secretary of State for War that the command of the troops in Egypt was to be reorganised, and that I was appointed General Officer Commanding-in-Chief all the Imperial forces in this country, which added to my original command the command held by General Sir John Maxwell. The preliminary details for carrying this change into operation were fixed at a Conference with General Maxwell held on 13th March, and on 19th March I formally took over the whole command in Egypt, thus ending a system of dual control which had of necessity been unsatisfactory, especially from the point of view of economy. By this change I not only became responsible for the .administration of martial law in Egypt and the maintenance of order throughout the Nile Valley and Delta, but I also succeeded to the direction of the operations against the Senoussi on the Western Frontier, which had very appropriately been brought to a triumphant period by General Maxwell by his victories which led to the .occupation of Sollum on 14th March, the capture of Gaafer, the dispersal, with the loss of all his guns, of Nuri's force, and the recapture from the enemy of 90 British prisoners taken by hostile submarines. The unification of the command in Egypt made large economies in staff possible, and these were carried out at once. The Levant Base also ceased to exist, General Sir Edward Altham, K.C.B., remaining as Inspector-General of Communications. The work of reorganising the forces and staffs for the Delta and Western Frontier Force was pushed on as fast as possible. I decided to keep General Headquarters at Ismailia, and to establish at Cairo a General Officer Commanding the Delta District, who would also act as Commander of L. of C. Defences. For operations on the west I formed a Western Frontier Force, divided into two sections, a north-western and a south-western, divided by a line drawn east and west through Deirut. These staffs and forces were definitely established and at work by 1st April. The whole force under my command now took the name of Egyptian Expeditionary Force. Towards the end of March, at the request of the Sirdar, I undertook the responsibility for the defence of the reach of the Nile between Assouan and Wadi Haifa. Captain F. H. Mitchell, R.N., D.S.O., was sent for this purpose to make all arrangements for an armed naval patrol of this reach. On 18th March, Captain H. R. H. the Prince of Wales took up his duties as Staff Captain on my Staff, remaining till his departure from Egypt on 1st May. 6. As soon as the conduct of operations on the Western Frontier devolved upon me, I took steps, in consultation with the various officers who were then best acquainted with the situation, to estimate the size of the hostile forces with which I should have to deal, and to determine the policy along this front of over 800 miles by which the Nile Valley could best be protected. It appeared from the information placed at my disposal that the Senoussi forces, spread over the whole Western desert, did not exceed 3,000, and it was certain that the enemy's moral had been severely shaken by Sir John Maxwell's recent successful operations. The chief dangers, therefore, against which I had to guard were enemy raids upon the Nile Valley, the stirring up of native tribes that were inclined to be well-disposed towards the Senoussi, and the creation of unrest in the Nile Valley .and Delta among disaffected or nervous elements of the population. The chief end to be held in view was to prevent any local success on the part of the Senoussi. On 15th April the Kharga Oasis, which had previously been reported by aerial reconnaissance and resident agents to be clear of the enemy, was occupied without incident. The movement of troops was effected by the existing light railway, and by the 18th April a force numbering 1,660 of all ranks was concentrated in the Oasis. On the 27th April the small oasis of Maghara was occupied. A strongly entrenched post has been constructed. The occupation of this post has materially assisted in preventing the passage of foodstuffs from the Nile Valley to the west, and denies the water to any enemy force attempting to move in the contrary direction. 7,000 rounds of small arms ammunition some twenty miles west of Sollum. On 23rd April an armoured car reconnaissance from Sollum discovered and brought in 140,000 rounds of small arms ammunition from a concealed depot. On the 30th April a further 20,000 rounds were discovered and brought in to Sollum. During this month, also, four prisoners, including a Turkish officer, were captured sixty miles west of Minia, and two small camel convoys were captured near El Alamein. The light car patrols were responsible for all these captures. 7. During the month of April reconnaissance was active all along the Eastern Front, with the result that by the middle of the month all water supplies of any importance within thirty miles of the Canal were patrolled by our troops, and mobile columns were ready to go out and deal with enemy parties approaching them, or, in the event of serious threat, td demolish the rock cisterns. In No. 1 Section, on 20th April, a patrol from Bir Mabeiuk came in contact with an enemy patrol, fifty strong, on the sand hills near the mouth of the Wadi Hamatha, some eighteen miles W.S.W. of Suez. A squadron and fifty rifles endeavoured to cut the enemy off, but he at once retired and scattered among the hills. Our casualties were two men killed. On 23rd April and the following days four columns, each composed of mounted troops and infantry, carried out reconnaissances of the approaches from the west to Ain Sudr and Sudr El Heitan. The columns returned to their respective posts on 26th April. In No. 2 Section, on 27th March, the 2nd Australian and New Zealand Army Corps came into existence on the departure of the 1st Australian and New Zealand Army Corps to France. The Corps was commanded by Lieutenant-General Sir Alexander Godley, K.C.M.G., C.B., and consisted of the 4th Australian Division, commanded by Major-General Sir H. V. Cox, K.C.M.G., C.B., C.S.I., the 5th Australian Division, commanded by Major-General Hon. J. MacCay, V.D., and the Anzac Mounted Division, commanded by Major-General H. G. Chauvel, C.B., C.M.G. (attached). In this section, the wells at Moiya Harab and Wadi Um Muksheib having been brought into the regular patrolling area, a very successful reconnaissance to Jif-jaffa was carried out between 11th and 15th April. The troops for this enterprise were a squadron of the 9th Australian Light Horse Regiment, accompanied by a detachment of Bikanir Camel Corps, and commanded by Major Scott, D.S.O., 9th Australian Light Horse. The objective was fifty-two miles from the starting point, and a jumping-off place for the attack, eight miles south-west of the objective, was reached at 2.30 a.m. on 13th April. From here an attack was launched by three troops upon the enemy's position at 9 a.m. The enemy, cut off in their attempted retreat by the right flanking party of the attack, stood at bay on one of the hills above the village, and lost six men killed and five wounded before surrendering. One Austrian lieutenant of engineers and thirty-three other prisoners were captured, our own casualties being one man and one horse killed. The destruction of the enemy's camp was thoroughly carried out, a quantity of correspondence was taken, and the elaborate well-boring plant, which had been at work for five months, was completely demolished. The manner in which this operation was carried out was most creditable, both to the commander of the column and to all ranks composing it. 10 miles south-east of Qatia, was reconnoitred by the Worcestershire Yeomanry. On the 6th April Brigadier-General E. A. Wiggin, commanding the 5th Mounted Brigade, took command of the Qatia District, and was made responsible direct to the headquarters of No. 3 Section. On 9th April, a further reconnaissance of Bir el Abd was undertaken by a squadron of Worcestershire Yeomanry. This time a strong party of enemy were found in possession of a ridge north-east of Bir el Abd. A sharp skirmish ensued when the Yeomanry attacked, and the enemy was driven eastwards from his position, but, owing to the heaviness of the sand, it was impossible for our cavalry to keep up the attack, and, after easily fending off an attempt at a flank attack, they withdrew unmolested. On 12th April, on orders being received for General Home to proceed to France, Major-General The Hon. H. A. Lawrence took over the command of No. 3 Section. By the 21st April, the railway towards Qatia had reached a point upon which a serious advance to hold the whole district could be based, as soon as the necessary dispositions could be made. On the 23rd, however, the enemy attempted to forestall any such advance by making a sudden raid in force upon Qatia. This operation, though comparatively small forces were engaged, produced the severest fighting yet experienced by the force under my command. 8. On 21st April, the 5th Mounted Brigade were disposed as follows: —The Worcestershire Yeomanry at Qatia, the Warwickshire Yeomanry, less one squadron, at Hamisah, 3 miles S.S.W. of Qatia, and Brigade Headquarters and the Gloucestershire Yeomanry at Romani, 6 miles N.W. of Qatia. General Wiggin, commanding the Brigade, had received orders to dispose his Brigade in the Qatia District in such a manner as to protect all railway, topographical and water survey parties, with special attention to the exploitation of the water supply; also to observe the route eastwards towards Bir el Abd, but not to take any serious offensive measures without further orders. It had also been impressed on General Wiggin by the General Officer Commanding No. 3 Section that, since it would take two days to reinforce him with infantry, he was, in the event of a heavy attack, to manoeuvre back upon Dueidar, 13 miles from Qantara on the Qatia road, or upon the railhead near El Arais some 7 miles N.W. of Qatia. On the evening of the 21st one squadron of Worcestershire Yeomanry moved into bivouac at Oghratina, 7 miles E.N.E. of Qatia, to cover an R.E. party detailed to prepare wells. On the 22nd another squadron of Worcestershire Yeomanry proceeded to Oghratina, being replaced in Qatia by a squadron of Gloucestershire Yeomanry, pending the arrival of one regiment of the Anzac Mounted Division, which had been ordered up from Salhia so as to reach Qatia on the 24th. The remainder of the 2nd Australian Light Horse Brigade was marching) to arrive at Qantara on the 23rd. In Qatia the squadron of Gloucestershire Yeomanry was covered by good trenches for some 50 or 60 men, and a number of smaller shelters afforded good covers. Their horses were picketed close to their camp. The Officer Commanding the two squadrons of Worcestershire Yeomanry at Oghratina had been told to push on entrenchment as far as possible, and it was General Wiggin's intention that these squadrons, if attacked in force, should retire on Qatia and thence, if necessary, on Romani, with their left flank covered by the Gloucestershire Yeomanry and their right by the Warwickshire Yeomanry from Hamisah. On the morning of the 23rd, both posts stood to arms at 4 a.m., and I have ascertained that patrols had gone out by that hour, though those at Oghratina were probably much hampered by a thick fog. On the 22nd April the Royal Flying Corps reported to No. 3 Section that new bodies of enemy troops were at Bir el Bayud, 15 miles E.S.E. of Qatia, and Bir el Mageibra, 10 miles S.E. of Qatia. Upon receipt of this information, General Wiggin obtained leave from General Officer Commanding No. 3 Section, to attack the enemy at Mageibra that night, reporting that he intended to use two squadrons of Warwickshire, and the one remaining squadron of Worcestershire Yeomanry. General Wiggin, with Lieut.-Colonel Coventry, commanding the Worcestershire Yeomanry, accompanied the raid to Mageibra. Finding very few enemy, they destroyed the camp and returned to Hamisah about 9 a.m. on the 23rd with six Turkish prisoners. In the meantime the post at Oghratina was attacked at 5.30 a.m. This attack was repulsed. No further information was received from the Officer Commanding at Oghratina until 7 a.m., when he reported that he was again heavily attacked on all sides. This attack carried the post, all the garrison of which were either killed, wounded, or captured. No details of tie fighting have, therefore, been obtainable. Qatia itself was attacked about 9.30 a.m. Lieutenant-Colonel Coventry was detached with one squadron of Worcestershire Yeomanry from General Wiggin's Force to operate towards Qatia. Unfortunately, this squadron became involved in the unsuccessful resistance of the Qatia garrison, and, with the exception of some 60 men and one officer who were able to disengage themselves, fell with it into the hands of the enemy. I have therefore been able to gather no detailed information of the actual fighting at Qatia. General Wiggin and Colonel Yorke, commanding the Gloucestershire Yeomanry at Romani, both showed great judgment in dealing with the situation, and did all that was possible with their small forces against the enemy force of about 2,500, with four guns of small calibre. General Wiggin pushed forward from Hamisah north-east against the enemy's left, south of Um Ugba, and drove him back for about a mile; the advance was slow owing to the nature of the ground and the determined resistance encountered. Colonel Yorke. after hearing that Dueidar was safe, moved his whole force at 10 a.m. to attack the enemy's right advancing on Qatia. He skilfully drove the Turkish right back to El Rabah, and caused their guns to shift their position further east. The enemy gave ground slowly, and, since by 3.30 p.m. it was evident that Qatia had fallen, General Wiggin determined to fall back: he himself retired on Dueidar by way of Hamisah, Colonel Yorke on Romani; neither were followed. Meanwhile, at 5.30 a.m. a Turkish force, 1,000 strong, with one gun, advancing from the south, attacked Dueidar, the most advanced defensible post, which was held by 100 men of the 5th Battalion, Royal Scots Fusiliers, under the command of Captain Roberts, 5th Battalion, Royal Soots Fusiliers. This officer, who throughout showed conspicuous skill and ability, succeeded in repelling two determined attacks on the position at 6.30 a.m. and 8.30 a.m. respectively. Both attempts cost the enemy dear. At 9.30 a.m. reinforcements of two companies 4th Royal Scots Fusiliers, under the command of Major Thompson, 4th Battalion, Royal Scots Fusiliers, who had been despatched from Hill 70, seven miles away, on. the first news of the attack, arrived at Dueidar. The various posts were strengthened, and a counter-attack, delivered at 12.30 p.m. with great spirit, forced the enemy to retire, leaving 30 prisoners in our hands and 70 dead. The Turks were pursued in their retreat by the 5th Australian Light Horse, who had only arrived at Qantara at 1 p.m., and by aeroplanes, thereby suffering further loss. Besides the three and a half squadrons of Yeomanry and details lost at Qatia and Oghratina, our casualties on the 23rd were two officers and 18 men killed, four officers and 21 men wounded. Aeroplane reconnaissance on the evening of the 23rd established the fact that the enemy force, which included a large body of picked Turkish regular troops, was already retiring. At dawn on the 24tihi eight machines of the 5th Wing, Royal Flying Corps, made a bomb and machine gun attack from a low altitude on the enemy troops left in Qatia, causing very heavy casualties and completely destroying the camp. One machine also located and attacked a large body of enemy at Bir el Abd, and located another party retiring on Bir el Bayud. On the morning of the 25th further bomb and machine gun attacks were made by the Royal Flying Corps on enemy forces at Bir el Abd and Bir el Bayud. Both attacks were extremely successful, working great havoc among men and animals. I cannot speak too highly of the admirable work done by the 5th Wing, Royal Flying Corps, during these few days. The strain thrown on pilots and machines was very heavy, and the former displayed the utmost gallantry and resource on all occasions. Chiefly through their efforts the enemy was made to pay a very heavy price for his partially successful raid. The general situation in front of No. 3 Section was not affected by these operations. Our Cavalry continued to patrol the Qatia district, which was now practically clear of the enemy, while our infantry posts at Dueidar and Romani were strengthened, and the railway towards Romani was pushed on with all speed. 9. After 16th January, when General Sarrail assumed supreme control of the operations of the Allied Forces at Salonica, the British Force there commanded by Lieutenant-General Sir B. T. Mahon, K.C.V.O., C.B., D.S.O., only remained under my control for administrative purposes. From the beginning of January to the end of April no active operations of importance took place. The general line of defences remained practically unaltered. Some 200 miles of deep trenches, including communioatdon trenches, 710 emplacements for guns, 230 reduits or strong posts, 160 miles of obstacles (barbed wire), and 1,300 miles of telegraph cable have been completed; and thedefences as a whole are now quite ready for occupation should the situation demand it. As in Egypt, so in Salonica, the administrative work has been extremely heavy. At the, outset tne state of the communications was very unsatisfactory. There were only two metalled roads leading to our lines, both in a shocking state of repair; the few existing tracks soon became impassable in wet weather for everything except pack animals. The construction and repair of roads had, therefore, to proceed simultaneously with the preparation of the defences. Roads in the forward area were all begun by the troops themselves, and all ranks worked admirably, the men thoroughly recognising the importance of the matter. Later, it was found possible to organise local civilian, labour companies, who have largely been employed to complete and maintain the road work begun by the troops. Altogether about 90 miles of new metalled cart roads have been constructed, and 105 miles of mule tracks, besides some 60 miles of repairs to previously existing roads and tracks. Railway extensions leading to the various depots on the Monastir road, with the necessary sidings, have been constructed, and Decauville lines laid within the depots themselves. Preparations have been made for further extensions. Another great difficulty, that of insufficient wharfage accommodation, has been met by the construction of new piers in the bay itself and at Skala Stavros. These have reduced the congestion to an appreciable extent and fully justified the labour and expense involved. The supply system, though hindered at first by the state of the communications and by the fact that the equipment of the force with a special scale of transport was only in process of gradual completion, has worked with uninterrupted success. The health of the troops has been excellent, all ranks having benefited by hard physical work in good climatic conditions. In view of the approach of summer, when malaria is likely to prevail in certain districts through which our line passes, special precautions have been taken for the protection of the troops and, where possible, alternative positions prepared. Throughout the period the importance of training the troops has been insisted upon. At first one day weekly was devoted to training, as opposed to road-making or work on the defences. This proportion has gradually risen to four days weekly, excluding one day of rest. 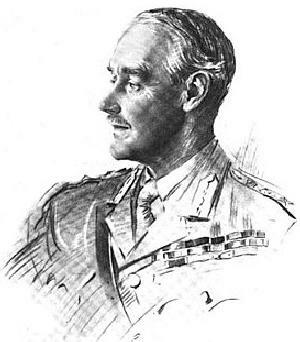 On 9th May, under orders from the War Office, Lieut.-General G. F. Milne, C.B., D.S.O., succeeded Lieut.-General Sir Bevan Mahon, K.C.V.O., C.B., D.S.O., in command of the Salonica Army. General Mahor sailed at the same date to take up command of the Western Frontier Force in Egypt. 10. In Egypt during the month of May there was no major operation to record. Intelligence received early in the month showed that the Turks had materially increased their numbers in Sinai, doubtless with the view of detaining troops in Egypt. The enemy's main concentrations were too far away for me to strike at them, and I was in hopes that he might be induced to cross the barrier of hills which extends from north to south some sixty miles from the Canal: he would then have been exposed to attack with the denies behind him. However, he made no such advance, and, during the hot weather in the middle of May, there were indications that he was drawing in his advanced posts. On the 8th and 21st May enemy aircraft attacked Port Said with bombs, doing no material damage. On the first occasion three civilians were wounded; on the second two civilians were killed, five soldiers and thirteen civilians were wounded. In each case the attack was answered by prompt and successful retaliation by the Royal Flying Corps. In all sections of the Eastern front reconnaissances were frequent, particularly in No. 3 Section, to which were now allotted three brigades of the Anzac Mounted Division. During the month the Mahemdia-Romani district has been occupied in some force, and at a conference, held on 17th May, at which General Lawrence, commanding No. 3 Section, was present, further decisions regarding the occupation of the Qatia district were arrived at. During the month several successful reconnaissances to the east were made by the Anzac Mounted Division, which proved itself a unit upon which I could absolutely depend to display energy, resource and endurance. On the 8th May, starting early from Oghratina, the 2nd Light Horse Brigade reconnoitred to Bir el Abd with patrols pushed out to Hod Salmana. On the 16th May, a day of intense heat, the same brigade, starting from Hod el Sagia, five miles E.S.E. of Qatia, reached Hod el Bayud, 15 miles on in the same direction, at 7 a.m. Camels and dismounted men were seen making off in a north-easterly direction. The enemy's camp was destroyed, and one prisoner, 36 camels, and a quantity of ammunition were brought in. The reconnaissance returned to Qatia, having covered 60 miles in 30 hours. During this time the Canterbury Mounted Rifles went out to Bir Abu Afein, covering 40 miles in 30 hours. On the 18th May a very successful bombardment of El Arish from the sea and the air was carried out. A sloop and two monitors of His Majesty's Navy bombarded the town, reducing the fort S.W. of the town to ruins and damaging the aerodrome. The seaplanes of the Royal Naval Air Service then attacked with bombs, being followed later by 6 machines of the Royal Flying Corps, who had orders to attack any enemy aircraft that appeared and to bomb the enemy's camp and troops. The camps were effectively bombed, and three bombs exploded in the middle of a body of a thousand men who were on the march south of the town. A close reconnaissance of El Arish from the air was made, and many valuable photographs taken at the same time. All ships and aircraft returned safely. On 22nd May the Royal Flying Corps carried out a highly effective bombardment of all enemy camps on a 45 mile front roughly parallel to the Canal, during which severe damage was done to the waterworks at Rodh Salem and to buildings at El Hamma and Bir Mazar. On 23rd May the 2nd Australian Light Horse Brigade reconnoitred Hod el Gedaidia, 15 miles east of Qatia, where shots were exchanged with a patrol of 40 men on camels, who retired. Finally, on 31st May, the New Zealand Mounted Rifles Brigade, one regiment of Australian Light Horse, and a sub-section of the Ayrshire Battery R.H.A., attacked the enemy's post at Bir Salmana, 20 miles E.N.E. of Qatia. The post was surrounded before dawn, and an enemy post on the Ganadil road was rushed, while a camel detachment was seen making off to the south-east. The enemy lost 15 men killed and 2 men captured. Our cavalry pursued till 8 a.m. when the pursuit was taken up by aeroplanes which bombed scattered parties with effect, killing 20 camels and 8 more men. The force returned, having covered 60 miles in 36 hours besides fighting an engagement. The only casualties were two men slightly wounded. On the Western Front during May preliminary measures for the occupation of the Baharia Oasis have been in progress. A line of blockhouses has been established along the Darb el Rubi which runs due west from Samalut on the Nile. Four blockhouses were completed and occupied by 23rd May. Work on the two> remaining blockhouses has been postponed till the railway has reached a point where it can materially assist in the supply of stores: this should be about the end of June. From the most advanced blockhouse it is now possible to reconnoitre as far as the Mohariq sand dunes, some 80 miles west of Samalut. The difficulty of maintaining such a line in a waterless desert subject to frequent and severe sand storms has not been small, but all ranks have worked well and with great keenness. The enemy has a small body of troops, under the command of Nuri, collected on the Libyan side of the frontier west of Sollum, but as yet he has not openly displayed his intentions. Two battalions of Italian troops landed at Moraisa during the month and have occupied Bardia. The relations between the Italian and British commanders on the frontier are excellent. The area between Sollum and Barrani has been cleared of the Bedouin population, and, though it has been impossible entirely to prevent communication between the Bedouins and Siwa, the energy of our patrols, according to numerous reports, is successfully restricting the entry of food supplies into Siwa. By means of patrols of Imperial Camel Corps and motor cars, communication between the oases occupied by the enemy and the Nile Valley and Delta has been rendered almost impossible. In particular, the camel patrolling from Kharga towards Dakhla and Beris has been carried out most efficiently by No. 1 Imperial Camel Company under especially trying conditions. The Farafra, Baharia, Mognara and Wadi Natrun fronts have also been controlled with great vigilance. The Aulad Ali tribes in Egyptian territory are now all west of Barrani, except for a receiving camp at Sollum. Markets have been established for the sale of food at Sollum, Mersa Matruh, Dabaa, El Hamman and Wadi Natrun, where they are allowed to purchase what is necessary for their daily needs. This restricts indiscriminate movement to the west or to the Delta. In spite of the occupation, during very hot weather, of so many advanced posts in the desert or on its edge, I am glad to report that the health of the troops has been remarkably good. I much regret, however, that General Sir Bryan Mahon, shortly after his arrival in this country to take up the command of the Western Frontier Force, had to be invalided home owing to sever sunstroke. In the meantime, Major-General A. G. Dallas, C.B., has continued, with great ability, in temporary command of that force. 11. I beg to acknowledge with great respect the valuable assistance I have received from His Highness the Sultan of Egypt. He has with great kindness placed at my disposal his unrivalled knowledge of affairs affecting his country. To His Excellency the High Commissioner, Lieutenant-Colonel Sir A. H. McMahon, G.C.V.O., K.C.I.E., C.S.I., and to the Government of Egypt, I owe a deep debt of gratitude for whole-hearted co-operation and help. I am very greatly indebted to Vice-Admiral Sir R. E. Wemyss, K.C.B., C.M.G., M.V.O., and the naval forces under his command for constant assistance and active co-operation. The construction of Roads, Waterworks, and kindred tasks in connection with the Canal Defences, which I have described to you, owe their accomplishment in a very large measure to the admirable services of Colonel Sir Murdoch Macdonald, K.C.M.G., of the Public Works Department of Egypt. His wide experience and capacity have been an indispensable asset to me in dealing with these important problems. I am particularly indebted to the Railway Department, under Colonel Sir George Macauley, K.C.M.G., R. of O., Royal Engineers, for the highly successful manner in which Railway communication has been carried on under great difficulties. The movement of a large number of troops and impedimenta of an Army has severely taxed the capacity of the railway, and has put a great strain on its staff. That it never failed to accomplish what was desired is due to the high efficiency this Department has attained, and to the personal exertions of Colonel Sir George Macauley. I wish to bring to your notice the very responsible and important duties that have fallen to my Director of Army Signals, Brigadier-General M. G. E. Bowman-Manifold, D.S.O., R.E., and to the admirable way in which he has discharged them. Military operations on the two fronts have been spread over a very wide front, amounting to close on 1,000 miles in the west and 90 miles in the east. Prompt and reliable inter-communication has been a matter of vital importance. In the successful achievement of this I beg also to bring to your notice the services of the Egyptian Telegraph Department under Lieutenant-Colonel J. S. Liddell, D.S.O., Royal Engineers, and to express my thanks to the Eastern Telegraph Company and the Telephone Company of Egypt, who have given my Director of Army Signals unceasing valuable help. I beg to bring to notice the valuable services rendered to the Canal Defences by the representative and principal officer of the Suez Canal Company, Charles Comte de Serionne, Agent Superieur de la Compagnie du Canal de Suez, .and by the staff of that company. The arduous and important work of the care of the sick and wounded in the Hospitals has been considerably lightened by a large amount of voluntary aid. I wish specially to mention the work of the British Red Cross Society and Order of St. John of Jerusalem under Sir Courtauld Thomson, C.B. The Nursing services, both English and Australian, have done admirable work, and the voluntary aid of the Sisters of Notre Dame de la Delivrance, working at the Austrian Hospital at Alexandria, have been specially Drought to my notice. Finally, and in conclusion, I wish to bring to notice the admirable services of my Chief of the General Staff, Major-General A. L. Lynden-Bell, C.B., C.M.G., my Deputy Quartermaster-General, Major-General W. Campbell, C.B., D.S.O., and my Deputy Adjutant-General, Major-General J. Adye, C.B. No Commander-in-Chief has ever been more loyally served, and no staff has ever worked with less friction. I have other names to bring to notice for distinguished and gallant service during the operations under review, and these will form the subject of a separate communication.